“So, I can’t just put all the managers in a room and tell them to figure it out?” she guessed. “Your role is one of integration,” I nodded. “Like all the dotted lines on the org chart?” Regina offered. 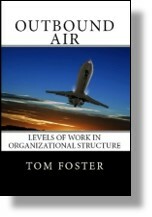 This entry was posted in Organization Structure and tagged accountability, ambiguity, authority, dotted lines, Outbound Air on June 18, 2015 by Tom Foster.